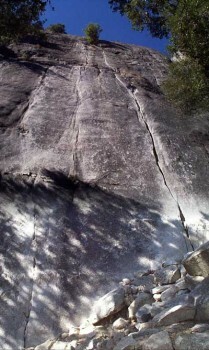 The first pitch features good climbing with a desperate crux. The second pitch has excellent polished 5.9 face climbing, but is runout. The route is easily top-roped from the P2 anchors of Jamcrack. Which SuperTopo guidebooks include a topo for Bummer?